Denise and I doing our favorite activity: ATVing in the Smokey Hills State Forest. The Man of the Hour today was my son Benjamin. He graduated from high school and will be heading to the University of Minnesota for pre-med in September. He has completed 1 year of college while in high school and has also received scholarships and grants that will cover his entire sophomore year. He has also been accepted in the Honor Society of Biological Sciences at the U of M. I'm a proud mama. Wild animals from Wyoming become farm animals in Minnesota. There are both bison and elk farms in this area (as well as emu and yak farms). As I passed a bison farm the the other day I had to smile to myself as I saw a vehicle pulled over and the driver taking pictures of the bison. I assume they had never been to Yellowstone. My cell phone decided to wait until I was on a cross country trip to die. With 11 months left on my cell plan I was reduced to paying for a brand new phone. I got it just in time for Jackie and John to text me from Yellowstone to tell me that it was snowing there. Tomorrow morning at 5:00 I will be leaving Minnesota. Though it was great to get back here to visit family and friends I am looking forward to going home ~ my home in Yellowstone National Park. Well, I'm back in Minnesota. I left Yellowstone at 6:30 am on Wednesday and arrived at my destination in Minnesota at 10:30 pm. It's a long drive but I tend to be a power driver so I manage to easily drive long distances in one shot. On Thursday night I went out to eat with my mom and dad, my son Adam, his fiance Heather and my granddaughter Kaylee. She has grown so much and is the perfect baby - all smiles and grins. What a sweetie. I am staying at my friends, Lyle and Denise, 250 acre ranch. They raise Black Angus and it is calving time. I sit on their back porch listening to the mama cows bellowing for their babies when they fall behind or frolic off too far. The calves are adorable and they love to leap and twist while they play with each other. The weather has been extremely warm here. It was 90 degrees today which is a welcome change from the cooler temps I have been experiencing in Yellowstone. I check out the Weather Channel to see what is happening in the Park and I saw that it was 32 degrees with snow possible. I'm enjoying the sunny warm weather here. The family pet, Lucky, has been finding the warm temps too much and yesterday decided that a nice cool dip in the manure pit was in order. We spent the rest of the evening trying to stay up-wind from Lucky. Farm life is not for the weak. I once raised miniature donkeys and my daughter has taken ownership of two of them. Here I am with Pokie who was my first donkey (he's a standard donkey). He started my lifelong love for donkeys. He's a chocolate colored donkey who has the trademark intelligence of the donkey. I nicknamed him Fingerlips because of his uncanny ability to open any barn door or unlock a chained gate with only the benefit of his lips. This is Maggie. She is the newest addition to my daughters herd of gaming horses. Courtney is a barrel racer who has qualified the last two years for the world championships. She also hopes to someday acquire and train a mule and a cow for barrel racing. I guess she got her love for animals from me. Dave will greet you with a hearty "Hello!" and have a smiling face as you enter the Yellowstone Adventure Store in Canyon Village. Here Dave shows off (with the trademark open-palmed point) the magnet display that has become his pride and joy. His knowledge extends beyond magnets and also includes binoculars, camera memory cards, apparel (including Merrel, Columbia and Cloudveil) as well as outdoor recreation equipment. Great work Dave! Hello Dan! I'm ok, just sooo busy and so little time to post! Also, a big 'Hello' to Sharron; Martha from Kentucky and to Dave & Maryellen who I stopped in the store when I was out. Sorry I missed you! Friday I had to take a quick trip to Mammoth in the afternoon to pick up an order and had the opportunity to see a grizzly bear at Swan Lake Flats. I saw it as I traveled by at 35 mph heading back to Canyon. Being that I was on a mission for work I thought it best I continue on my way and get my frozen food order back to the store while it was still in it's frozen state. Dunraven Pass opened up at 8:00 Friday morning and was promptly closed by the next morning. It still is closed due to snow/ice. By this time the people working in Canyon are pretty excited at the prospect of traveling on a fresh road so the opening of Dunraven is something to celebrate. Now with it closed we wait in anticipation for its reopening. I have yet to travel it and I look forward to my first 2010 pass over the pass. Sylvan Pass was also closed for awhile Saturday which delayed my departure to Wapiti and Cody. Winter just will not give up its icy grip on the higher elevations here. As much as I whined about the lack of snow this winter I really have had about enough it at this point. As I write Yellowstone is in yet another winter advisory with up to 7 inches of snow expected. So far the snowfall from this storm is lackluster which is fine with most of us living here. Spring please make your sunny appearance here at Yellowstone! I have been seeing quite a few grizzlies lately. Besides the one at Swan Lake Flats on Friday I also saw a bear across from the Canyon corrals late Friday afternoon. Also another one right on the side of the road east of Lake Butte on Sunday evening. I have lost track of the number of sightings this year which is in direct contrast to my scrupulously listing every sighting I had in the early part of the season last year. I gave up after a couple of months but I do remember my grizzly sightings reaching 45 for 2009 and about 25 black bear sightings. On Wednesday I will be heading back to Minnesota for a short visit. I look forward to seeing family and friends. It will be a shock to my system to head into 80 degree weather and I will have a short-lived sympathy for my chilled friends back here. Actually the weather is supposed to warm up here but I do chuckle when I think that I need to go to Minnesota to get a tan! That seems so wrong. Lately I have been having blogtime management issues. I've been doing a lot and seeing a lot but I just haven't found time to sit down and fill everyone in on the going-ons around here. I've had a few grizzly sightings. One at Swan Lake Flats and one by Yellowstone Lake. I even saw 3 male bighorns as I headed east over Sylvan Pass. There was a kill a couple days ago (I was there before the death) by Twin Lakes but there was so many people pulled over and wandering around I could only get a glimpse of an elk standing in the water. What the predator was I don't even know. If you remember my "Beauty and the Beast" story from last year you may recall that I'm not well suited to seeing the actual death. Yesterday morning I went to Hayden Valley to make a phone call (I actually get 3 bars on my phone there!). There was a black wolf in Alum Creek with an elk kill. Another elk was wandering around nervously watching it's friend being consumed. I was in the pullout just south of Alum Creek on the phone when over the ridge came the wolf heading right toward my car. It decided to cross the road at the edge of the pullout and I watched in shear amazement. Everyone who was watching the wolf from a distance was up at the pullout to the north and here I was, having arrived late for the action, with a front row seat to the wandering wolf. And since I was only there to make a phone call I didn't even bring my camera. There was also a couple of black bears by the Canyon Junction late this afternoon. Excited guests were busy telling the Associates about it. The weather has been alternating between snow showers and rain. There was even a thunderstorm a couple days ago. One bolt of lightening hit by the dorms behind the big store. I happened to be sitting on the steps outside at the time and it felt like my heart was going to stop from the loud bang. It caused some telephone and computer issues at the big store and I immediately came in and unplugged my computer. As of this past Monday I am officially a Wyoming resident. I've waited many months for Sylvan Pass to open up so I could get to Cody on a weekday so I could do this. There are quite a few people working in the Park who are from Minnesota and I jokingly like to say that Minnesotan are taking over the Park. Or am I joking?! The Park is becoming increasingly busy. With the big store having opened last Monday the Adventure Store closed it's Fountain. Sunday was the last day it was open and over 170 hot dogs were sold. Those who work in the Fountain at the big store got some practice in before the 1:00 opening by cooking and serving the employees breakfast and lunch. I had a huge stack of pancakes. I could only eat 1/4 of it and I was still digesting them by the time lunch rolled around so all I could order then was french fries. Too bad I was so full from breakfast because we were able to order anything off the menu and I've really wanted to try a bacon cheeseburger. I purposely took a drive after work tonight so I could get some pictures so I could share them. Wouldn't you know it, I finally had my camera and didn't see a thing. The Park is steadily getting busier. The store is a constant stream of guests. New arrivals came in on Monday to the 'big' store. The Adventure Store is sometimes referred to as the 'little' store and the General Store in Canyon is referred to as the 'big' store. There are so many new faces that it is hard to believe that we will all know each other in just a few short weeks. A family is being born. I went to Cody this weekend and along that short drive I managed to spot a grizzly bear by Sedge Bay and 3 moose just east of the East Entrance. 2 of the moose were probably the mama and yearling moose I saw a couple weeks ago. Patrick took me to the Buffalo Bill Museum in Cody, which I highly recommend! There are 5 different themed museums in the building but I only managed to see the Buffalo Bill area and I will be saving the other four for other visits. Our return to the Park made an unplanned detour after finding out the East Entrance had been closed. because of weather/snow. So at 6:30 that evening we had to make the 6 hour drive back via the Chief Joseph Highway which is beautiful but by the time we got to the Northeast Entrance it was dark. We made it back at 12:30 after seeing a white leggy wolf by the South Rim Drive. It was just wandering down the road squinting his eyes from the cars headlights. I have decided there are a few people who don't realize that birds are included in the No Feeding the Wildlife rule in Yellowstone. After watching a man throw crackers still in their cellophane wrappers to Edgar I had to put on my 'mommy pants' (what I refer to when I have the unpleasant task of asking someone nicely not to do something) and remind him that the ravens are wildlife and cannot be fed. Edgar doesn't care for me much because I think that he has figured out in his little brain that when I'm around there will be no more delicious crackers for him. After dinner last night I headed out for Hayden Valley. By Otter Creek a grizzly bear came out of the woods and onto the road. He continued on right out into the Yellowstone River and swam across while a Canada Goose swam toward him and then realized this was not something it should be making such an intimate acquaintance with and immediately honked and swam away. What a lucky sight to see! He walked around the opposite shore occasionally scratching and sniffing the dirt and then climbed back into the rive and swam back. I moved to the picnic area parking and watched as he wandered around there for awhile. Then he was back in the river swimming to the other side. I eventually left him and went to Hayden Valley where I watched a lone bison graze. I'm sure that seems anticlimactic after my grizzly sighting but there is something calming about just sitting and watching a bison. They are still my favorite animal in the Park. This evening I went to Gardiner to run a couple of errands and on my way back as I came across a very large bear jam. I could tell the bear was close to the road (and the people!!) because every once in awhile people would turn and walk very briskly toward their cars and once they reached their cars people would wave them back and they would walk back toward the bear. I stayed in my car waiting for an opportunity to drive between all the parked cars. When I finally had a clear shot I maneuvered through the vehicles and I got a glimpse of the bear........and how close the people where actually to him. They were a mere 50 feet!!! Tomorrow is my one year anniversary in Yellowstone. It has been one fun and crazy adventure. I'm looking forward to starting year two and I can't wait to see what is in store for me. 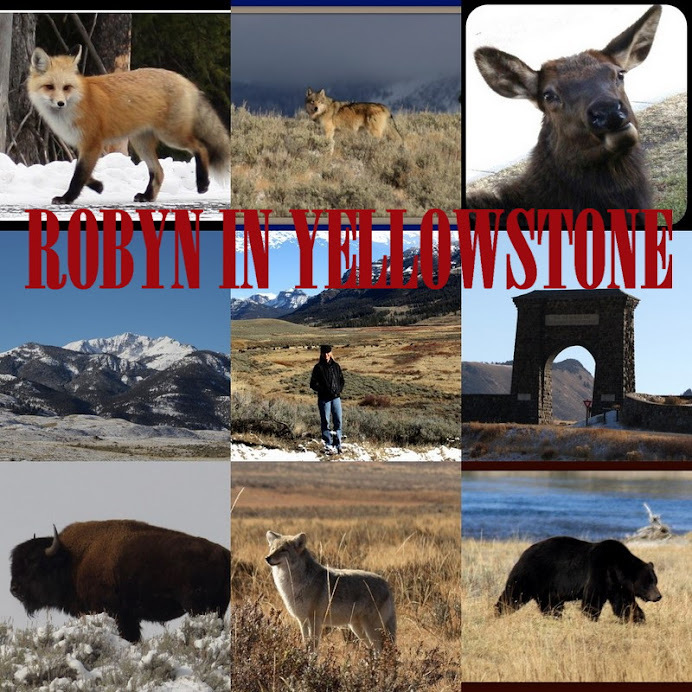 More bears, bison, moose, wolves, elk, bighorn sheep and more friends. Thanks everyone for sharing Year One with me! Wednesday morning various locations in Hayden Valley were covered by a low lying fog. Frosty bison by Sulphur Cauldron Wednesday morning. The trees that had fallen across the road from the wind and then cut up the previous morning are visible. Yellowstone River from Fishing Bridge Wednesday morning. It was 0 degrees at the time. The sun was just ready to rise over the ridge in the back. An interesting thing happened at the store this week. A letter arrived addressed to Hamilton Stores with no return address. When it was opened it contained a $100 bill and a short note saying: This is for a knife taken from the store many years ago. The handwriting appeared to be an elderly males (though I am no handwriting expert). He obviously has spent many years wracked with guilt over having taken a knife and decided to set things right with his heart. It made us feel good that someone wanted very desperately to do the right thing and we very much hope that he is at peace now. It goes to show that it is never too late to do the right thing. I spent Tuesday evening puppy sitting for Patrick while he was at meetings in Bozeman. It feels good to spend some time with animals. I have always loved animals and there are very few things that feel as good as a big old sloppy puppy kiss. So there is no surprise that tonight I jumped at the chance to walk, feed and play with Jack and Rosie's dogs while they are in West Yellowstone for the night. People that I worked with last year at the YGS in Canyon are beginning to trickle in. I was taken pleasantly by surprise when Jack & Rosie walked into the store this morning. Lots of hugs and catching up soon followed. Then later in the day Ken and Joanne came in. I had already spent time visiting with Jackie & John but they stopped in, too and we spent some time chatting. Jean & Roy are here and I planted a seed in Roy's head about making the garlic pesto ravioli that I love (I also volunteered to be a taste tester). So my day was filled with reunions with old friends. Tomorrow new people will be showing up who will be spending the summer at the big store. I can already feel that I have some new friends coming my way. This afternoon Lee was walking on the road by the cabins at Canyon. As she walked she heard a sort of a huff. She thought it was her jacket rubbing and continued on. Then she heard it again. She turned and noticed a grizzly bear (Scarface?) about 30 yards from her. Luckily it was turning and walking away from her. She put her hand on her bear spray and decided to head the other direction. I am so happy that things turned out the way it did for her and now she has a great story to call home about. A Yellowstone Hello to Alan! Have a safe trip into the Park. And also to David who made it to Old Faithful to start his first job in the Park. You have a great experience ahead of you. I'm also keeping track of Stephen and his travels to the park via his gps tracking system. Yesterday I spent my day in meetings learning things such as how Wyoming Workman's Comp paperwork is to be filled out correctly. I can't believe I still am still able to cram more info into my brain. After the meetings and before dinner I did take a quick drive back into the Park and saw my first baby bison of the year. There were two little red babies with their mothers by the Madison River. With the wind, snow, and rain I wasn't able to get a very clear picture of them off in the distance. Andrea and Dave watched a bison give birth in Lamar Valley the other day (all while Andrea was updating her Facebook status). That would be a special experience, one that I have come close to seeing but only managing to come across the baby as it is still wet and laying on the ground. Yesterday it was snowy and windy here in West Yellowstone. I stopped to see John and Jackie and their trailer would occasionally rock back and forth from the wind gusts. Last night at 10:00 I noticed something light up the curtains. Then I heard a loud rumbling. Thundersnow! Crazy spring weather! There is more snow and wind in the forecast. I am beginning to long for a warm sunny day where standing outside doesn't involve windburn and snow blindness. I took a drive through Hayden Valley late Friday afternoon. I noticed a set of ears on top of a hill right off the side of the road and realized that a coyote was laying down at the top. It opened it's mouth and gave out a huge yawn. Then it got up it did a big stretch and another yawn. I spent the next 20 minutes watching it trot along, stop and tilt it's head as it stared and listened attentively to any noise a rodent may be making under the snow. It would continue on and eventually decided to come down onto the road and walk down the middle of it. After a bit it crossed over and wandered off across the snow. I have been seeing many sandhill cranes in Hayden Valley. They walk around in pairs picking at the bison manure. Scarface was across from the corrals again Friday afternoon. He was digging and tossing dirt and snow behind him as he dug for a snack. The ravens sat along side waiting patiently for a tidbit to come their way. This morning I found 4 coyotes laying in a group in Hayden Valley. This is three of them and after watching them for about 5 minutes they all eventually rose and walked the opposite direction as me. I went into Bozeman this morning to pick up some odds and ends. I saw big horn sheep in Yankee Jim Canyon right on the side of the road. The canyon is a place where a driver should always pay special attention for rocks that have slid down onto the road and for big horn sheep that tend to graze on the side of the road. By Livingston I watched a bald eagle chase another bird around. The eagle was diving toward the bird and lost control and the truck in front of me had to break hard not wanting to have a bald eagle slamming into their windshield. It eventually gained control and swooped up in the knick of time. Since I had to be in West Yellowstone this evening for my 8:00 am meeting tomorrow I came back this afternoon through Mammoth so I could stop back at Canyon to do payroll. I saw the wolves by Swan Lake but had to keep moving forward toward Canyon so I didn't get any pictures. A few miles down the road I saw a grizzly bear off to the west, but once again time was not on my side so I kept going. I made it to West Yellowstone this evening at 8:00 and stopped in to visit with Judy who will also be attending the meetings Monday and Tuesday. I also know Jean and Roy are here and John and Jackie are somewhere in West Yellowstone. I will search them out tomorrow. Right now I'm lounging in a extremely comfortable bed watching tv and using high speed internet. This is quite a treat!